Yeti Casino is owned and operated by L & L Europe Ltd. The company is licensed and regulated in Malta by the Malta Gaming Authority (MGA) and in the UK by the UK Gambling Commission. Yeti Casino is an online NetEnt casino with games from NetEnt, Microgaming, and Amatic. If Yeti Casino sounds like the perfect online casino that suits your gaming needs, then have a look at the Yeti Casino Review below. The Yeti Casino Review will give you the latest updates regarding the Welcome bonus offer, and also how to get your No Deposit free spins. Yeti Casino offers players a wide selection of the top online slots from NetEnt, Microgaming, and Amatic. Play the most popular NetEnt slots, such as: Starburst, Wild Wild West, Divine Fortune, Dead or Alive, and Blood Suckers. The newest NetEnt slots such as Copy Cats, Scruffy Duck, and Fairytale Legends: Hansel and Gretel are also available. The very best Microgaming slots are also offered at Yeti Casino. Play Ariana, Immortal Romance, Bridesmaids, Break da Bank Again, Tarzan, and Jungle Jim El Dorado. If you are looking to win big, then progressive jackpot games are right up your alley. The top jackpot progressive games that are on offer include: Mega Moolah, Mega Moolah Isis, Arabian Nights, Mega Fortune, and Hall of Gods. Yeti Casino also has a great selection of table games on offer, such as: Roulette, Baccarat, Red Dog, Blackjack, Punto Banco, and Texas Hold’em. There is also a Live Casino for all our players that enjoy interacting with dealers in live casino games. The games and RNG (Random Number Generator) are constantly being monitored and audited by independent organizations in order to protect the integrity of play at Yeti Casino. Instant play casino, no downloads are required. Limited selection of slot games from three casino software providers only. Players from the USA not accepted. All new players can sign up for a Yeti Casino account to receive 23 No Deposit Extra Spins on Joker Pro or Starburst. Sign up for a Yeti Casino account now to claim your Extra Spins. 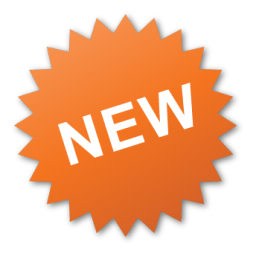 New players from the following countries are eligible to receive the Welcome Bonus: Australia, New Zealand, South Africa, Netherlands, Germany, Austria, Switzerland, Canada, Sweden, Denmark, Norway, and Finland. 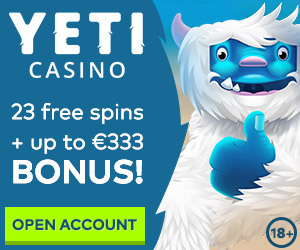 Get a 100% Welcome Bonus up to €333 + 77 Extra Spins when you make your first deposit at Yeti Casino. Play your Extra Spins on Joker Pro or Starburst. The minimum deposit to receive this welcome bonus offer is €10 or equivalent. New players from the UK are eligible to receive a 100% up to £333 Refund Bonus with 77 Extra Spins when you make your first deposit at Yeti Casino. The 100% up to £333 Refund Bonus will be issued the next day to all new UK players that make their first deposit and lose it. Players must be 18 years or older. Full Terms and Conditions can be found here. BeGambleAware. 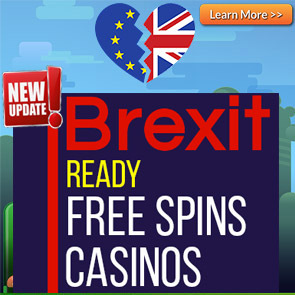 Free spins winnings must be wagered 40 times before any withdrawals can be made. Players from Canada will receive their No Deposit Extra Spins on the following games: Lightning Hot, Admiral Nelson, or Book of Aztec. 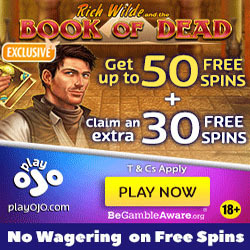 Players from India are prohibited from receiving the No Deposit Extra Spins offer. The maximum winnings from your No Deposit free spins is capped at $/£/€100. The deposit options at Yeti Casino are: iDeal, Neteller, Skrill, Visa, Mastercard, Bank Transfer, Paysafecard, Boku, and Sofortueberweisung. You can deposit using the following currencies: EUR, GBP, SEK, NOK, AUD, CAD, NZD, and ZAR. English, Norwegian, Swedish, Finnish, and Dutch.